As always, the EMO tradeshow is a great opportunity for SolidCAM to present its best and latest developments in machining. At EMO 2013 it will be demonstrating its new SolidCAM 2013 SP2 version that includes some of the best features and improvements yet. SolidCAM 2013 SP2 has more than 100 new enhancements across all its modules: iMachining 2D 3D, 2.5D Milling, HSS, HSR/HSM, Sim 5X, Turning, Advanced mill-turn for multi-turret and multi-spindle machines, as well as a new module - Solid Probe. The handling of large models in SolidCAM 2013 has been dramatically improved, with immense time savings, due to much faster facet generation - resulting in huge reductions in programming time for big CAM-parts. For SolidCAM's 2.5D Milling module, additional Toolbox operations have been added, while Threading and Engraving operations have been enhanced. The HSS complementary module for surface machining has also been upgraded with extra auto detection for radial and spiral technologies and lead-in ramping options. SolidCAM 2013’s powerful 3D Milling solution, comprising the High Speed Roughing (HSR) and High Speed Machining (HSM) modules, has additional new strategies and benefits including Hybrid Machining, faster multi-core calculation, which uses the full power of your computer’s processors, and smoother surface finishes. The latest version includes major enhancements to the Simultaneous 5 axis module. New tilting options have been added and improvements made to the SWARF, 5X Drill and Convert HSM to Sim 5X operations. In addition, three new operations have been added to the Sim 5x module, making it one of the most powerful of its type. The new Multi-blade machining operation easily handles impellers and bladed disks, with multiple strategies to efficiently rough and finish each part of these complex shapes. The Port machining operation is a new and easy to use method for machining ports with lollipop milling tools - four strategies are provided to machine and finish a port: Rouging, Rest Rough, Spiral and Plunge Finishing. The new Contour 5-axis machining strategy tilts the tool along a chained 3D profile according to defined tilt lines, making it ideal for deburring and trimming. The Advanced Mill-Turn module in SolidCAM 2013, handles any type of multi-turret and multi-spindle CNC machine and sets the standard for easy programming for these complicated machines. The Machine control operation MCO, balanced roughing, multi-turret synchronization and full machine tool simulation have all been extensively improved. SolidCAM’s patented iMachining 2D module, with its Technology Wizard, provides users with the fastest cycle times, saving 70% machining time and more, unmatched hard material machining, significantly longer tool life and outstanding small tool performance. Now, with the iMachining 3D module, users can automatically produce a complete, ready to run CNC program, with optimal cutting conditions, for 3D Parts. This is achieved by the software’s expert Knowledge-based Technology Wizard and Toolpath roughing and rest roughing a complete 3D part, with true scallop on all slopes, all in a single operation. iMachining 3D, combined with its full-depth step-down, intelligent step-up, localized machining and smart positioning, achieves the shortest optimal cycle time, saving up to 90% compared with other systems, for roughing and semi-finish of molds and complex 3D parts. With iMachining 3D, you can also mill prismatic parts, which include hundreds of pockets and islands. This can be done in one operation, without the need for defining geometry chains, directly from the solid model of the part and the solid model of the stock. iMachining 3D will do the rest automatically and optimally. SolidCAM continues to push the CAM boundaries with the launch of its Solid Probe module. The new Solid Probe allows users to define the home position and to perform part measurement cycles during machining, and is completely integrated with the other SolidCAM operations. Additionally, it supports tool presetters and tool breakage detection. Machining operations and Probe operations are intermixed in the CAM manger, using the same geometry. Should the solid model change, both the machining and probe operations automatically synchronize to the alteration. 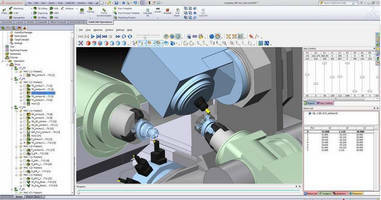 SolidCAM is the leading integrated CAM for SolidWorks. In SolidCAM 2013 an option has been added to save all CAM-data inside the SolidWorks SLDPRT/SLDASM file and to work with SolidWorks in Part Only (without assembly) mode. Furthermore, Solid Verification has been speeded using multi-core calculation and can now also be shown, together with 3D tool, in the SolidWorks window, enhancing the integrated experience for SolidWorks users. SolidCAM provides a powerful, easy-to-use, integrated CAD/CAM solution that supports the complete range of major manufacturing applications, including iMachining 2D and 3D, 2.5D Milling, High Speed Surface milling, 3D Milling/High-Speed Machining, Multi-sided Indexial 4/5 axes Milling, Simultaneous 5 axes Milling, Turning, advanced Turn-Mill and WireEDM. SolidCAM's patented, unique revolutionary iMachining technology saves 70% in CNC machining time and more and extends tool life dramatically. TheiMachining Technology Wizard provides a reliable partner in automatically determining speeds and feeds and other machining parameters. iMachining provides unbelievable savings and increased efficiency in CNC milling operations, translating into profits and success. All SolidCAM customers worldwide, who bought iMachining, are enjoying immense savings! SolidCAM has been a Consistent Growth Leader in CAM. Along with a worldwide direct sales channel from our many international SolidCAM offices, we also have a worldwide CAM distributor network in 50 countries. The industrial user base includes more than 18,500 seats installed. Our SolidCAM professor videos provide hundreds of easy to follow tutorial videos which are available on our website. CAM Software supports 3Dconnexion motion controllers. Mechanical Suite for Revit enables user to create virtual piping project.